The 2018/2019 edition of the Italian Cup will meet on Thursday, January 31, its last semi-finalist. The schedule of the quarterfinals phase will be closed with the classic involving Internazionale and Lazio. The match will be held at the Giuseppe Meazza stadium in Milan, starting at 18h (Brasília time). The winner survives. In case of a tie, the regulation establishes an extension of 30 minutes. If equality persists, the definition will be made through penalty kicks. Inter had an unbeaten run of seven games (four wins and three draws) closed on Sunday, January 27. For the twenty-first round of the Italian Championship in Turin, was beaten by Torino by 1 to 0.The result did not bring significant change in his situation in the Italian Championship. The Milanese team was in third place in the Serie A standings and remained there. With 40 points (12 wins, four draws and five losses), only the differences compared to the closest competitors have changed.Second-placed Napoli, who drew with Milan away from home, extended their lead to eight points. Milan, fourth placed, reduced their handicap to five. However, as the title is out of the question, since Juventus have 19 points more, the great measure for Inter is the difference for fifth place, first team outside the classification zone for the 2019/2020 edition of Europe Champions League. In this case, the Milanese club has six points facing Roma.Performance as a principal follows the same performance parameters. Internazionale has the third best home campaign of Serie A. Of the 30 points played as column one, it has won 23 (seven wins, two draws and one defeat) with 17 goals scored and four goals conceded.Has the best home defense of the Italian Championship. Even the virtual champion Juventus suffered more goals in their domains. There were five, although he played one more match as the main player (11 to 10) than Inter.For Thursday’s meeting, coach Luciano Spalletti is expected to have two casualties due to medical problems. They are in the ward the defender Sime Vrsaljko and the striker Balde Keita.How good he ended in 2018, so stupid at first in 2019. 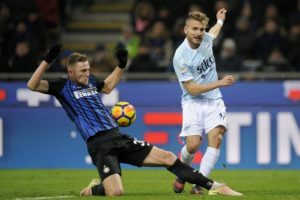 Inter comes after two matches he did not manage to score, and Spalletti found out, more directly or circumstantially, that he would not continue on Meazza and from the next season. Inter seemed to finish the goals in the first match in 2019, 6-2 with Benevento in the finals. With Sassuolo (0-0) and Torino (0-1), Spalletti’s team struggled to the wrong side.Although he is looking to leave, Perisic has been called for Lazio, but will not be the title. Newcomer Cedric is summoned, but most likely he will start in the second half. De Vrij and Keita Balde are injured. Spalletti will return to the 4-defender module and give up the Icardi-Lautaro couple on the offensive. Politano, suspended for the championship match with Bologna, will be the holder. Instead of Perisic, Antonio Candreva will play.Inter was eliminated in 4 of the six occasions in which he played in quarters, in recent years, after having passed each time in the previous 8 situations. This will be Lazio’s third consecutive classic. The first two were for the Italian Championship and ended in defeat. The Romans lost, as visitors, to Napoli and then, as principals, to Juventus. Both duels had a score of 2 to 1.The cost of two rounds without scoring was high. Lazio has fallen to eighth on the Serie A table with 32 points (nine wins, five draws and seven losses), and is out of the region that places international tournaments next season. This block is closed by Sampdoria, which has one more point.Performance as a visitor follows the same measure. Lazio is also the eighth-best player in Serie A. In the 30-point column, he took 14 (four wins, two draws and four losses) to the home with 11 goals scored and even number of goals conceded.Owner of the best attack last season of the Italian League, the team has been disappointed in the offensive power. In the current season, there were 30 goals in 21 games. It is the third worst performance in the top ten.For the meeting this Thursday, coach Simone Inzaghi has two restrictions to scale the team. Midwayers Bruno Jordan and Luis Felipe are in the care of the medical department.Neither Lazio is in a better situation. Moreover, Inzaghi’s team lost both championship matches in 2019, but has the excuse to play against the top two – 1-2 with Naples and Juventus. The effort in the Juventus match has left some traces, so Simone Inzaghi will rest a handful of titles.Milinkovic-Savic, who will be suspended for the match with Frosinone, will still be the holder. Just like Acerbi, who was suspended with Juventus. And Marusic comes after the suspension and goes straight into the first 11. Durmisi, Berisha and Caicedo are new names, compared to the last championship match. Patric, Luiz Felipe and Lukaku are injured, Cataldi is suspended.Lazio made it easy, in eighth, Novara (4-1). Lazialii scored all goals in the first half. Lazio has arrived in the semifinals in the last 2 years but never scored in the penultimate act for 3 seasons in a row. The impression that comes with watching both Internazionale and Lazio games is that both teams have the ability to deliver much more than they have actually shown. In the case of Inter, this is a low risk methodology adopted by coach Luciano Spalletti. In the case of Lazio, a retreat from Simone Inzaghi to try to give the team more balance. It has not been successful, at least until now, in this search. The team lost much more offensively than it won defensively. The scenario makes the prognosis in the equality is good option of guess for the confrontation that ends on Thursday the phase of quarterfinals of the Glass of Italy in his season 2018/2019. Both Inter and Lazio come after modest results in the final stages of the championship, but I think this will cause the players of the two teams to be more aggressive. The matches between Inter and Lazio, no matter where they played, were full of events. I’m counting on a regular match, which would mean at least one goal in the first half. If the ball enters the ball once, the stake is returned, if it does so multiple times, the bet is winning. In 4 of the last 5 matches he scored at least once in the first 45 minutes. In the last two, two goals scored.